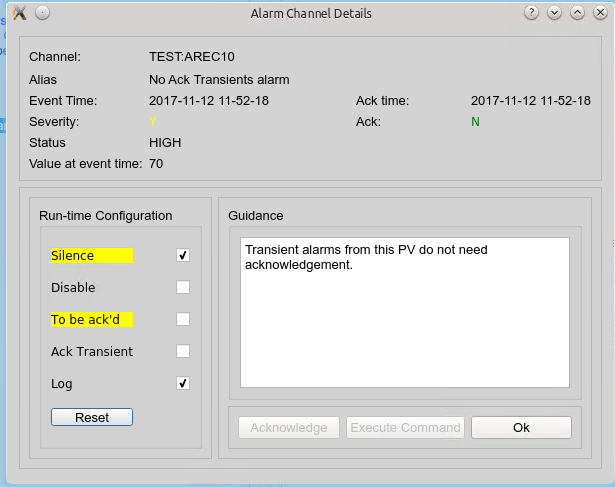 The run-time configuration of an alarm or an alarm group is modified on the dialog which is opened by right-clicking on an alarm or alarm group or on the corresponding in-line display. Changes to the run-time configuration are valid for the current TAlh session only. Changes to the run-time configuration apply to the current TAlh instance only, even if TAlh runs in global mode. A yellow label indicates that the run-time configuration is different from the configuration file. Permanent changes to the alarm configuration file can only be made if TAlh was started using the "-e" command line switch. Configuration changes take effect immediately for the current TAlh session. A save of the configuration file is necessary to persist the changes beyond the duration of the current TAlh session. The -e command line switch enables the permanent configuration editing functions of TAlh. editing of the alarm configuration is enabled. the main menu bar will show an enabled "Edit" menu with all menu items enabled. CTRL-right-clicking on an alarm or an alarm goup will open a dialog which shows the configuration of this alarm or alarm group. CTRL-SHIFT-right-clicking on an alarm or an alarm goup will open a dialog for editing the configuration of this alarm or alarm group. changes to the alarm configuration can be saved to the configuration file or a different configuration file. editing of the alarm configuration is disenabled. the main menu bar will show an enabled "Edit" menu with all menu items greyed out with the exception of the Add Monitor item. both CTRL-right-clicking and CTRL-SHIFT-right-clicking on an alarm or an alarm goup will open a dialog which shows the configuration of this alarm or alarm group. The guidance for alarms can always be edited. CTRL-right click on an alarm to get the popup-dialog for modification. Modified guidance will be saved to the alarm configuration file if TAlh has write access to the alarm configuration file. Alarm filters can always be edited. CTRL-right click on an alarm to get the popup-dialog for modification. This modification creates a temporary alarm filter which overrides any filter defined in the alarm configuration file. Ttemporary filters are only valid for the current TAlh session and arenot saved to the alarm configuration file.